Dock Box S Fi: audiophile dockingstation for Apple music players! 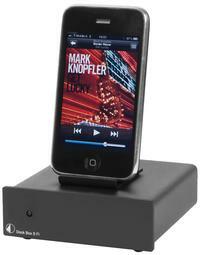 Dock Box S Fi makes your iPod part of your audiophile hifi system at home. Dock Box acts like a perfect buffer amp for the iPod and therefore lowers the distortion level significantly. After passing an initial amplifier section, the signal is transferred to the hi-fi system with an impedance lower than 15 ohms. This guarantees troublefree signal transmission with ultra-flat frequency response and offers the best, most cost-effective way to build an audio system around an iPod.